Only a handful of high-draft pick receivers end up showing their full bag of tricks in their rookie seasons. It usually takes one or two years (see: DeAndre Hopkins, Davante Adams, etc.) for them to truly breakout. Such has been the case with Cincinnati Bengals wideout Tyler Boyd, who ended his rookie campaign with a solid 71.1% catch rate but only one touchdown to show for it. Year two for Boyd was supposed to be where he made his mark, but an injury and a lack of targets led him to just 225 receiving yards on 22 receptions and a rough 62.0 overall grade. But all it took was a healthy 2018 season (for the most part) for Boyd to finally break through the barrier that so many young receivers face. Even as A.J. Green garnered the lion’s share of targets from Weeks 1-to-8, Boyd proved to be quarterback Andy Dalton’s most reliable receiver. He hauled in 80.3% of his targets in that span, which ranked sixth among receivers and far ahead of Green’s 59.2% catch rate (76th). Boyd also caught 92.5% of his catchable targets in that span compared to Green’s 84.9%. Both receivers graded out in the top-15 through eight weeks, and it became clear Boyd had the skillset to punish opposing defensive backs, and as Green dealt with an injury after Week 8, the No. 1 receiver spot was Boyd’s to lose in his teammate’s absence. Before looking at the entire second-half of Boyd’s year, we’ll first focus on the three games he played as the No. 1 before Dalton was placed on injured reserve. He saw 23 targets in that span and hauled in 14 of the 16 catchable ones for the 14th-most yards (221), fifth-most yards after the catch (131) and sixth-most first down receptions (12). Then, it was Jeff Driskel time in Cincinnati. Boyd caught 15 of 16 catchable targets in the three weeks he was with Driskel before he too went on injured reserve. Interestingly enough, Boyd didn’t surpass 100 yards in a game since Green went down after Week 8. Either way, he’s proven that year three was his big leap despite the numerous injuries to the big names around him. In the season as a whole, Boyd was one of 17 wideouts to finish with 1000-plus yards, and he and Green were the only receiving duo to finish with grades in the top 12 among receivers. His 84.6 mark was easily a career-best, and the 127.8 passer rating he generated when targeted ranked sixth among wide receivers with 40-plus targets. Boyd also had no issues with the deep ball. He saw seven catchable targets of 20 or more yards in 2018 and was one of only three receivers with seven-plus deep targets to reel in every single one. A.J. 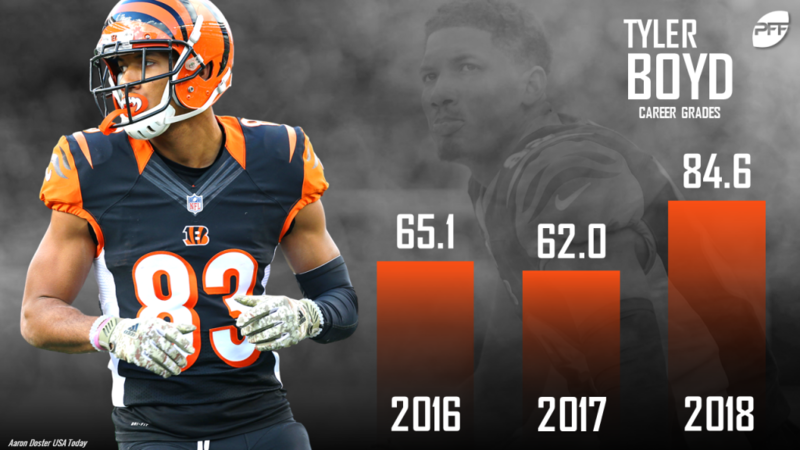 Green is the clear leader of a blossoming Bengals receiving corps, but Tyler Boyd did more than enough in 2018 to warrant recognition as a reliably lethal target.